Until “all open allegations are resolved,” Archbishop John Nienstedt is not free to exercise public ministry in the Archdiocese of St. Paul and Minneapolis, Archbishop Bernard Hebda clarified in a letter to the faithful Dec. 14. The 11-member Archdiocesan Ministerial Review Board, which addresses allegations of clergy misconduct, was consulted and recommended that Archbishop Hebda publicly clarify that Archbishop Nienstedt, like any priest facing similar allegations, is not free to engage in public ministry in this archdiocese until pending allegations are resolved. Archbishop Hebda said he agrees with the recommendation. The restriction took effect Dec. 13. The action “is not intended to convey an indication or presumption of guilt,” Archbishop Hebda said. The clarification of Archbishop Nienstedt’s local public ministry restrictions refers to a 2014 investigation into allegations that he had engaged in sexual misconduct with adults as a priest in Detroit and Rome, and as a bishop of New Ulm. Archdiocesan leaders engaged two separate law firms in the investigation. Archbishop Nienstedt, who resigned his position as leader of the Archdiocese St. Paul and Minneapolis in June 2015, has maintained that he is innocent of the allegations. The investigation was forwarded to the U.S. nunciature but has not been made public. 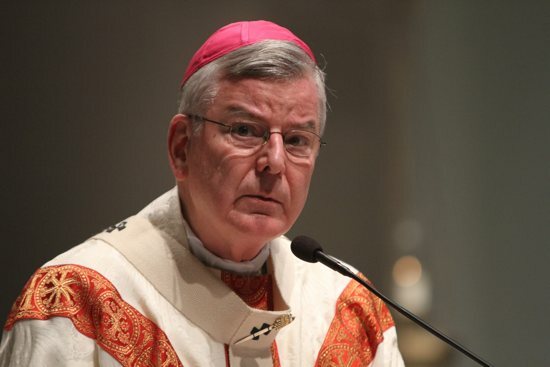 While the 2014 investigation involved allegations of sexual misconduct with adult males, the letter pointed out an allegation against Archbishop Nienstedt involving minors surfaced only after his resignation. The allegation was made not to the archdiocese but to the Ramsey County Attorney’s Office. It became public in 2016 when the relevant documentation was released by Ramsey County. At that time, Archbishop Hebda, who has led the archdiocese since Archbishop Nienstedt’s resignation, shared the released materials with the nunciature. According to the allegation, Archbishop Nienstedt, as bishop of New Ulm, undressed in front of two teenage boys at a hotel during World Youth Day in Cologne, Germany, in 2005. The three had been caught in a rainstorm, and, according to the allegation, Archbishop Nienstedt invited the boys to his room, where Archbishop Nienstedt undressed and then the boys undressed in front of him before putting on hotel robes as they waited for their clothes to dry. The individual said that at the time he felt uncomfortable with the situation, and that he told his mother about it when he returned home because he thought it was inappropriate. According to Archbishop Hebda’s letter, Archbishop Nienstedt denies the situation occurred. The restrictions on Archbishop Nienstedt’s local ministry reflect the approach archdiocesan leaders would take with any priest facing similar allegations, Archbishop Hebda said. “My opinion is that this allegation needs to be fully addressed before a definitive resolution of Archbishop Nienstedt’s suitability for ministry can be made,” he said. After serving as bishop of New Ulm from 2001-2007, Archbishop Nienstedt was appointed coadjutor archbishop of St. Paul and Minneapolis in 2007, and became its archbishop in 2008. He resigned in June 2015 after the Ramsey County attorney charged the archdiocese for failing to protect children in the case of former priest Curtis Wehmeyer, who has been convicted of abusing three boys in 2010-11. When the charges against the archdiocese were dismissed in 2016, the Ramsey County Attorney’s Office publicly released documents related to their investigation of the archdiocese. Among them was a summary of a Dec. 29, 2015, interview with an individual who described the World Youth Day situation. In the letter, Archbishop Hebda, who has led the archdiocese since Archbishop Nienstedt’s resignation, said he has been repeatedly asked whether there are restrictions on Archbishop Nienstedt’s ministry. “My answer has always been that although I do not know of any, I am the wrong person to ask: Bishops report to the Holy Father, not to each other. I have no general juridical authority over Archbishop Nienstedt or any other bishop outside the archdiocese,” he said. “I can, however, exercise some control over the types of public ministry permitted in this archdiocese” which led him to restrict Archbishop Nienstedt’s local ministry. Archbishop Nienstedt has continued to exercise ministry outside of the archdiocese, most recently concelebrating the Dec. 4 funeral of Bishop Robert Morlino of Madison. From 2016 to 2018, he was a contractor with the California-based Napa Institute. The institute announced Aug. 15 that the archbishop would no longer be serving it. The local restrictions put in place by Archbishop Hebda have no effect on Archbishop Nienstedt’s ministry outside of the archdiocese. In the Archdiocese of Detroit, where he resides, Archbishop Nienstedt, at the request of Archbishop Allen Vigneron, has already agreed “to abstain from public ministry in the Archdiocese of Detroit.” That agreement was made public by the Detroit Archdiocese Oct. 24. In the Dec. 14 letter, Archbishop Hebda emphasized his strong support for an independent, national lay-led review board to address misconduct allegations against bishops. The structure was one of the items the U.S. bishops discussed but — at the request of the Holy See — did not move to incorporate during their fall meeting in Baltimore. Archbishop Hebda hopes such a structure could definitively address the allegations against Archbishop Nienstedt. He said he would share the entire 2014 archdiocesan investigation of Archbishop Nienstedt with such a review board, and that until it is created, he will continue to advocate for it. “In this way, my hope is that resolution of the allegations against bishops and any additional investigation can be handled in a way that is fair to all and worthy of public trust,” he said. Archbishop Hebda released the letter as the archdiocese nears the end of a nearly four-year process of reorganization under Chapter 11 of the U.S. Bankruptcy Code. In January 2015, the archdiocese filed for bankruptcy protection in the wake of mounting claims of clergy sexual abuse dating back as far as the 1940s. In the end, 453 claims were filed against the archdiocese during the claim-filing period, most of which were related to suits brought against the archdiocese during a three-year-lifting of the statute of limitations on child sexual abuse claims in Minnesota. In May 2018, the archdiocese announced it had reached a $210 million settlement, and the reorganization process is expected to be completed by Christmas. In the letter, Archbishop Hebda outlined several additional efforts the archdiocese is taking “to change the culture that fostered the clergy abuse crisis,” including a new position in the archdiocese’s Office of Ministerial Standards and Safe Environment that aims to “ensure that the voice of survivors of clergy sexual abuse will be regularly heard within archdiocesan leadership,” he said. He also reiterated that any survivor who at any time entered into a confidentiality provision with the archdiocese is released from that provision. He also restated his willingness to meet with any survivor who would like to do so, and he is available Friday afternoons in February, March and April for these meetings. He is also available to meet at other times and at locations other than the Archdiocesan Catholic Center. Survivors interested in meeting with the archbishop should call the Catholic Center at 651-291-4400 or email archbishop@archspm.org.